I would think Elizabeth Moon's Paksennarion ought to be high on any list. I liked Polgara to start with, but by the time I was done with all of the books in the series, I was bloody sick of her. The snark, although quite funny in small doses, was a bit too much for me. By the end of it, she just came across as being insufferably smug. I remember one scene where she's sewing something, and Belgarion asks her about it, and she uses magic to fix the tear and then gives him an ear-bashing about magic and it's place in the world and howusing magic for magic's sake is bad and it keeps her hands busy and...Jesus wept, Polgara will you just leave it already! It doesn't help that Eddings goes to great lengths to describe how brilliant and perfect and totally awesome she is - as one of my friends put it, it felt like he was trying to make up for a missed anniversary with his wife or something. But that's just me ranting. She is a strong character, but perhaps too strong at times. Anyway I pretty much spoiled the Eddings books for myself by reading all of them one after the other very quickly, along with all the Sparhawk ones (Sephrenia annoys me too, btw) and...well, it's hard to describe why that spoiled it. It was just the sameness of it all, really, like trying to watch the opening sequence of She-Ra without thinking "My God, this is such a blatant attempt to milk the brand". Oh, I was going to suggest some of the women from Robin Hobb's Assassin/Liveship books...but it's hard to pick. The Fool is still waiting on results from the international sports federation to decide whether or not he/she can compete in the next olympics, Kettricken and Kettle are fairly minor, as is Elliana. @Stephen - I LOVED Silk, he was one of my very first teenage crushes :-) Thanks for the suggestions, I will start preparing a list. Of course, it does mean reading said books to make sure I can talk about them in an indepth manner! @Andrew - Yep, I definitely see your point that at times Polgara gets too much, and she can be insufferably smug at times. But I was looking for women who are portrayed in a strong and interesting manner, and she does seem to fit the bill! Kahlan out of Terry Goodkind's Sword of Truth series. Despite just about everything that Goodkind in the space of about 10 books throws at her (and believe me it's just about everything that you could possibly imagine!) she still rises above it all and triumphs. Moiraine or Cadsuane or in fact just about all of the female Aes Sedai in Robert Jordan's Wheel of Time epic. They seem to spend most of their time manipulating and telling the men what to do! For a while now I've been participating in a meme in which I talk about one of my favorite fictional characters each week, and I can't believe that I never thought to talk about Polgara. She is an awesome character (although she can often be annoyingly arrogant). I have been intending to reread these books, and even started a few months ago with Pawn of Prophecy, but I haven't yet moved on to the others. Some of my other favorite fantasy female characters are Alanna from The Song of the Lioness Quartet, Aerin from The Hero and the Crown, Thursday Next from Jasper Fforde's books and Alexia from Gail Carriger's Soulless books. Terry Pratchett has a few strong females notably Granny Weatherwax and Tiffany Aching. Althea Vestrit from Robin Hobb's Liveship Traders is also a possibility of course. Then there's Alexia Tarabotti from Gail Carriger, I think those books are more Fantasy than Science Fiction. Not sure I agree with Werehamster that Kahlan is a strong character. And I certainly wouldn't suggest anyone read through more than the three first books of the Sword of Truth series. 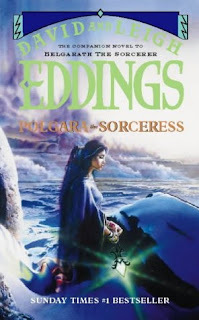 I love Eddings, he was my "gateway" fantasy author and got me hooked on fantasy forever, and Polgara was a great character even though Silk and Belgarath were my favorites. I'll have to chime in with Mara Acoma of The Empire Trilogy. She had to work her way up to become a powerful noble by being smart, innovative and a bit ruthless and yet she makes mistakes along the way. Cersei Lannister could use Mara's lessons! @Werehampster - I can sort of see your point about Kahlen, but I didn't enjoy the Goodkind experience and I think I'll keep her on the backburner ;-). The Aes Sedai angle is a good one though - I'll save some of them for when I do my full WoT re-read on the publication of the last book! @Ole - Love your Terry Pratchett character ideas. I would add in Susan as well - in fact, Sir Pratchett does a good line in strong, effective female characters! Now, I have to admit I haven't read all of the various books that feature her, just a few of the Belgariad. And then I only persisted because I'd been assured they get better. But Polgara never appealed to me as a character. She's too one-dimensional. Your first four points are variations on how powerful and all-round great she is, and even the snarkiness could be construed as wit, and therefore be seen as an asset. So she doesn't really have any flaws, and that's what I don't like about her, or indeed most of Eddings' characters in those books. When the good guys are so fantastic where's the room for conflict? How can you identify with characters so uniformly super-duper? What is Polgara telling us about the human condition? She's strong all right, and perhaps that stood for something more in the 1980s when she was created, but she's far too godlike for my preference. You make a good point, Ros, about her godlike abilities and attitude, but I actually interpreted that as one of her flaws as well: she sees herself as so powerful and in the right that it makes her stubborn and comes across as arrogant. I would also put forward as a foible of hers that she is a big nag. She is also grumpy on occasion, and has a flashing temper. I could highlight the many occasions when she causes problems by being all 'I know everything, and I'm not going to tell you because you don't need to know yet.' She also always thinks she knows best, probably because of her longevity. Sure, I highlighted her strengths, but I do think that Polgara is a rather well-rounded character in terms of virtues and flaws. So as I said I adore Polgara, because of the snark and because to me she's always seemed to have this profound ability to love people. Sometimes more deeply than even she wants to admit. Of course since Eddings was my first foray into fantasy as well (I only read it because my highschool crush was reading them *mortified* and then I decided I liked the books better than I did him lol) so I have a soft spot for these books, despite their many flaws. As for some suggestions: How about Phèdre from Jacqueline Carey's Kushiel books? She's all about the awesome and then some! Another female protagonist I adore is Karigan from Kristen Britain's Green Rider series. Gutsy, daring and stubborn as hell! And ofcourse, though I don't know how many would agree with me lol, Talia from Mercedes Lackey's Heralds of Valdemar series. 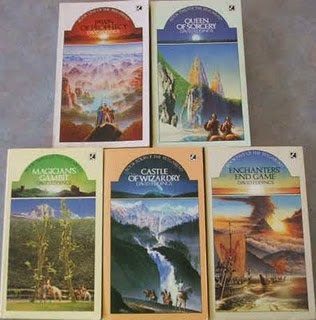 If Eddings got me in the door, Lackey got me happily snared in the genre of fantasy. I love how Talia escapes her awful childhood with her sweetness intact and how said sweetness overlays a core of steel. I have a few suggestions to add to the list - Amara from Jim Butcher's Codex Alera series (fantastic series - really recommend! ), Marla Wolfsblade from Jennifer Fallon's Wolfblade and Demon Child trilogies and Phedre in Jacqueline's Carey's Kushiels series. All women who grow and change in the course of the books. I love it. Wonderful. Eddings and Polgara is a perfect start. Nah, I don't think you have anything to worry about. Thanks for the post though. I have been on a look out for books lately and this is really a good post. This is helpful for me while working on a project. The thesis is really a great help too for research.. I was just wondering if this book can be shipped in our country? Also, if it's available in our country, does it come in the same title?